Christ School's College Guidance Department. March Madness will take on a whole new meaning next month in Mebane Field House. Christ School has been chosen to host the first-ever Asheville Independent Schools College Fair on March 20, with more than 100 universities from four different counties expected to attend. The free, students-only event is open to juniors and sophomores from Christ School, Asheville School, Carolina Day School, and Franklin School of Innovation. College representatives and test preparation companies will have booths set up in Mebane from 6:30 to 8:30 p.m.
Christ School's three-man College Guidance Department, made up of Director Kirk Blackard and Assistant Directors Jeff Depelteau and Thomas Becker, has put months of preparation into the fair. In future years, the plan is to rotate sites between Christ School, Asheville School, and Carolina Day. "It's going to be nice to be the first to host," Depelteau said. "To expose the students to such a variety of schools from a wide geography is rare. It's a good way to get the kids interested in not only schools in the Southeast, but beyond. 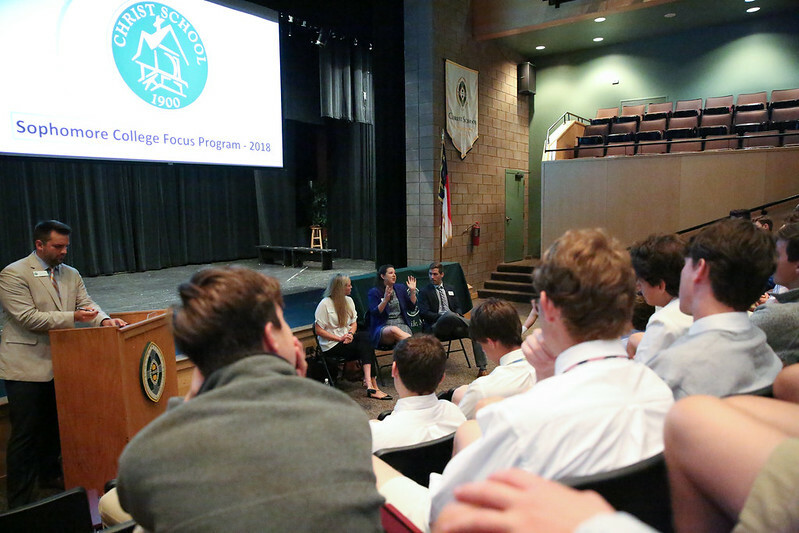 And from the colleges' perspective, they get a chance to get a great context of what Christ School is all about." How much added exposure will come from the fair for Greenie students? Becker explained that Asheville independent schools typically receive about 50 individual visits per year from college representatives. Boys may attend as many of these visits to Christ School as they choose, provided they clear it with their teachers. Spring Break for Christ School lasts from March 1-17. Once they return, sophomores and juniors will be prepped for the fair by the College Guidance Office. The Sophomore College Focus Program is designed to give 10th graders their first official introduction to the college process. This year, we had a great panel comprised of representatives from Georgia Tech, Elon University, and Roanoke College. The boys also enjoyed playing the GPA game and learning about the many components of the application that colleges and universities analyze when considering whether or not a student is a good fit for their institution.